Alibaba Group Holding Ltd is betting big on the fresh produce market by upping the ante in a major fresh food e-commerce platform. Tmall, Alibaba's business-to-customer unit, announced on Thursday it invested $300 million in Yiguo.com, a full-category fresh food site, to facilitate the expansion of its cold-chain systems nationwide. This is Alibaba's fourth major investment in the online retailer, following an undisclosed amount of Series C funding together with global private equity firm KKR in 2016. 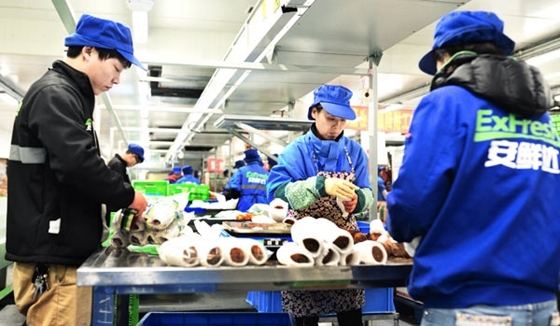 Yiguo delivers perishable goods, such as fruit, vegetables, meat and fish to more than 200 cities in China, offering most of its customers same day or second-day home delivery. Apart from its indigenous site and app, Yiguo also cooperates with Tmall Supermarket－a unit selling mostly fast-moving consumer goods－by carrying out daily operations of its fresh produce offerings. The financial backing will "push Tmall's ability in local sourcing, procurement, supply chain management and delivery to a new height", said Jing Jie, vice-president of Alibaba, in a statement. Yiguo said it will use the funds to expand the subsidiary's infrastructure so that it can process the 500,000 daily orders expected by the end of this year, and up to 5 million orders by 2020. The online grocery market is among the few niches that are set to enjoy exponential growth in China's already gigantic e-commerce landscape. The segment could achieve a market volume of 678 million yuan ($99.7 million) by the end of this year, nearly 10 times the value of the sector back in 2013, said Matthew Crabbe, Asia-Pacific research director at research firm Mintel. While online retail currently accounts for 3.1 percent of China's total grocery market, research firm IDG forecast the number will jump to 6.6 percent in just three years, driven by young and wealthier shoppers. "Alibaba's Tmall and JD.com are two major players in the Chinese online grocery market, although their strength lies in combining online marketplaces with bricks-and-mortar stores as well as their efficient distribution networks," said Shirley Zhu, a Singapore-based Asia program director at IGD. But the e-commerce giants will find it hard to crack the largest category－fresh food－due to the high costs of cold-chain delivery and the low shipping fees customers are prepared to pay, according to research by Goldman Sachs in March. To address that, both Alibaba and JD have finished building their key nationwide "fulfillment centers"－warehouses from which the distribution of goods is coordinated－allowing people in more than 200 cities to enjoy same or next-day delivery for groceries ordered online. They are also testing different business models for selling perishable food online. For instance, JD invested in retail chain Yonghui to boost its online-to-offline deployment, while Alibaba channeled resources to build the Hema Xiansheng store, featuring fresh produce offerings that are accessible both in-store and through a mobile app.